Orange were dominated on the road despite strong bench effort and forcing 19 turnovers. Braxton Beverly hit four threes and nine free throws in a blowout win for the Wolfpack. Jim Boeheim called further down his bench until the Syracuse Orange stunningly ran 10 deep into their rotations. For the first time all season a bench unit featuring Marek Dolezaj, Robert Braswell, Jalen Carey and Bourama Sidibe took the floor. They, not Tyus Battle or Oshae Brissett, scraped together a double-digit first-half comeback for SU. Cutting off passing lanes, drawing a charge at half court and compiling free throw attempts, they slowly, uglily embarked on a 11-0 run while N.C. State’s offense self-destructed. They made two free throws, shot 0-for-3 and turned the ball over six times. That’s as much momentum as the Orange garnered in a blowout 73-58 loss at the hands of the N.C. State Wolfpack. 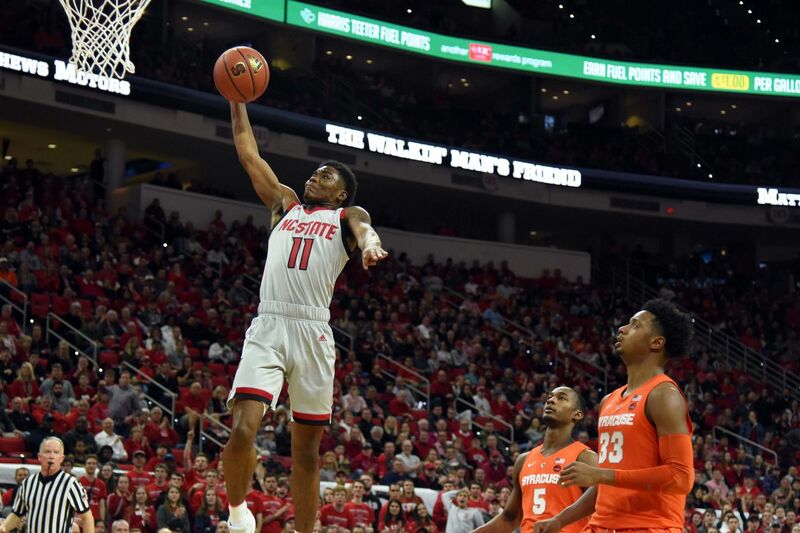 Frank Howard hit five threes in a bounce-back effort, but foul trouble held Battle to seven points and Braxton Beverly poured four threes and nine free throws in despite 19 turnovers undermining his offense. Dolezaj and Braswell both posted two steals late in the second half, cutting off back line passes by the Wolfpack. Jericole Hellems gave Dolezaj a shoulder and got tagged with a charge crossing half court, while the Orange scrapped together four free throw makes (missed four) late in the first half. Howard rotated back in and hit a three above the arc within seconds, then a layup to pull the Orange within one point before Braxton Beverly cut off the run before halftime to space N.C. State at 30-27. Syracuse trailed by as many as 12 in the first half as Brissett got tagged with three fouls playing around the rim, leading to his removal with 7:16 remaining. Beverly and Markell Johnson terrorized Battle and Howard on the ball, while the Orange scored zero points and committed three turnovers in the opening three minutes. Dolezaj hit a shot with everybody backing off and Elijah Hughes took Johnson’s errant in-bounds pass past half court and into an easy dunk to pull within 14-13. N.C. State rode a CJ Bryce block on Battle, Johnson dunk in transition and five free throws to push a 12-point lead. When Carey, Braswell and Sidibe entered they lost their flow completely. The bad fortune flowed into the early minutes in the second for the Wolfpack when Bryce injured his ankle on the first play while turning it over against Sidibe. He played through it, hitting a layup to respond to a pair of threes by Howard and setting up a 6-0 run by Beverly. N.C. State hit a deep three, then three at the free throw line to stay ahead of Syracuse’s early charge. After Torin Dorn beat the defense inside for a layup, N.C. State assumed an 13-point lead. Johnson tried to heave the ball up court to build the Wolfpack lead to 17, but traveled in the process, giving Syracuse another chance after four scoreless minutes to get back on their feet behind another by Howard. Dolezaj drew a flagrant foul on DJ Funderburk, but Funderburk drilled four free throws to score six of the next N.C. State points on the way to a 18-point lead. Battle sat with four fouls and in the ensuing three minutes Syracuse scored two points. When he hopped off the bench, he hit Paschal Chukwu for a dunk and swished a floater after Howard hit his fifth three to cap a 7-0 run. Battle fell on his back trying to force his way into the paint while Devon Daniels ran for a slam on the other end to go ahead 67-50 and cut off any chance of a Syracuse comeback. Battle laid there an extra moment, with a chance to finally climb the ladder in the ACC lost with a gauntlet ahead. Syracuse returns home next Wednesday to take on Louisville. That game tips at 7 p.m. ET and airs on ESPN.